John Wesley Thomas took pride in the technical quality of his portrait photographs. In an advertisement published in 1865, J. W. Thomas declared that "having due regard for the permanency of the prints, none but the purest chemicals are used on the premises". From when he began taking carte-de-visite portraits around 1862, J. W. Thomas numbered his negatives so that customers could order further copies. When he retired around 1900, J. W. Thomas had produced in the region of 62,000 negatives. The consecutive numbering of negatives means that it is possible to gauge Thomas's productivity over the years and, when a negative number is present, provide an approximate date for the photograph. 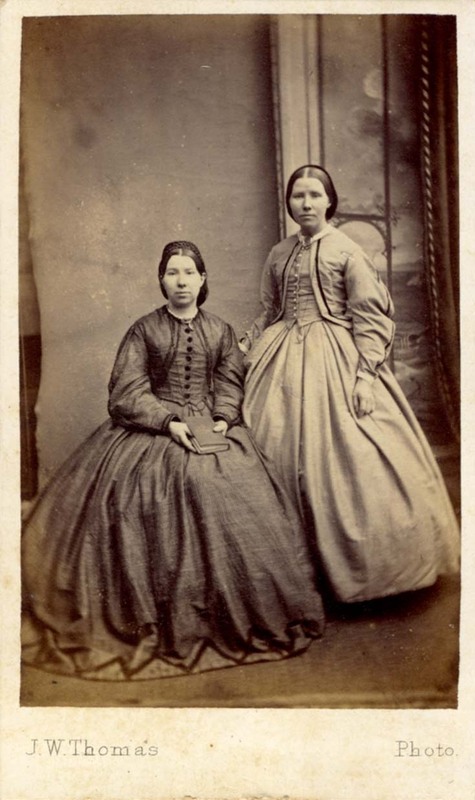 [ABOVE] A carte-de-visite portrait of two young women, taken at John Wesley Thomas's studio at 52 High Street, Hastings (c1864). On the reverse of this carte, inscribed in ink, is the negative number 3989. 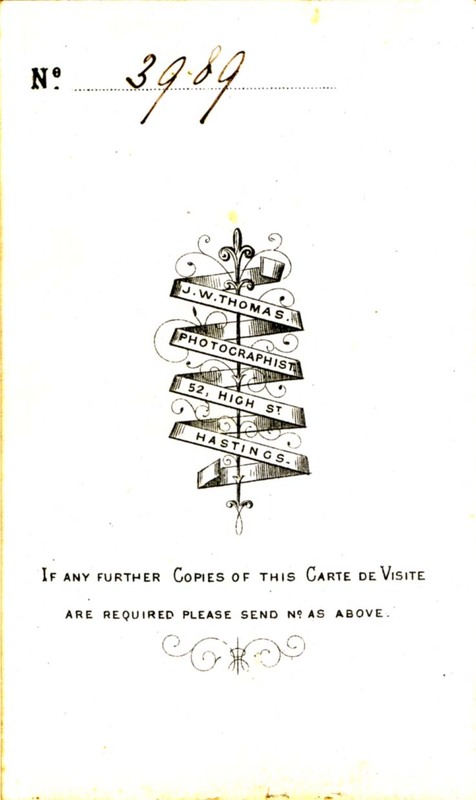 [ABOVE] The reverse of a carte-de-visite dating from the mid 1860s showing J. W. Thomas's trade plate for 52 High Street, Hastings. This is the back of the carte-de-visite portrait of the two young women, shown on the left. The negative number of 3989 can be seen at the top of the carte. [ABOVE] A carte-de-visite portrait of a seated man, taken at John Wesley Thomas's studio at 52 High Street, Hastings (c1864). On the reverse of this carte, inscribed in pencil, is the negative number 3934. 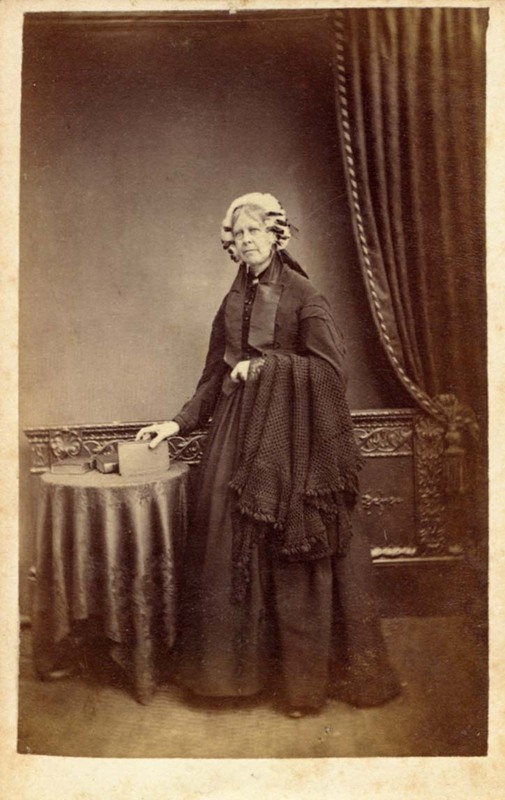 [ABOVE] A carte-de-visite portrait of a woman holding a book, taken at John Wesley Thomas's studio at 52 High Street, Hastings (c1864). On the reverse of this carte, inscribed in pencil, is the negative number 3401. 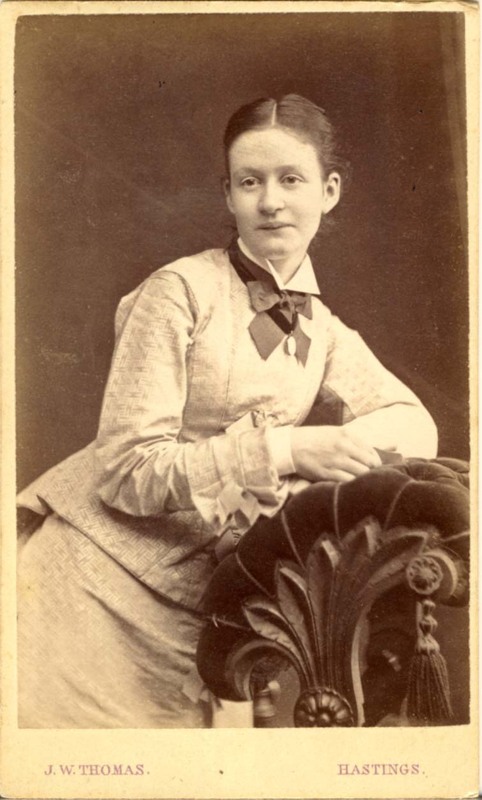 [ABOVE] A carte-de-visite portrait of a young woman, taken at John Wesley Thomas's studio at 45 George Street, Hastings (c1874). On the reverse of this carte, inscribed in ink, is the negative number 29,168. 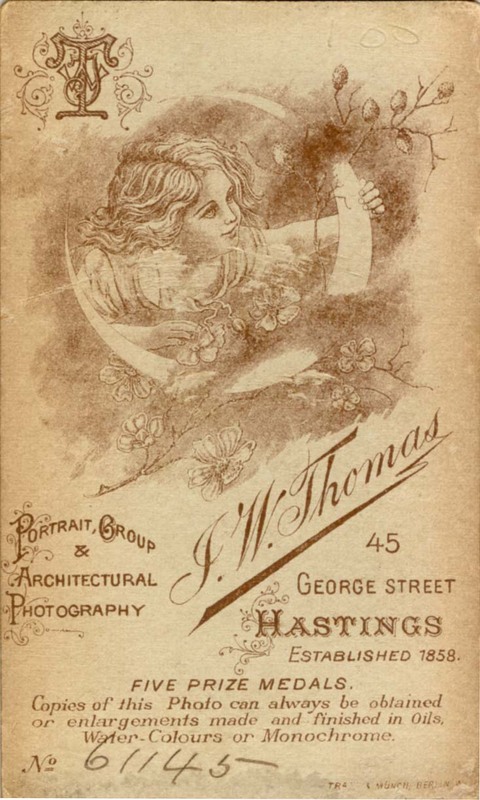 [ABOVE] The reverse of a carte-de-visite dating from the early 1870s showing J. W. Thomas's trade plate for 45 George Street, Hastings. This is the back of the carte-de-visite portrait of the young woman, shown on the left. The negative number of 29,168 can be seen at the top of the carte. 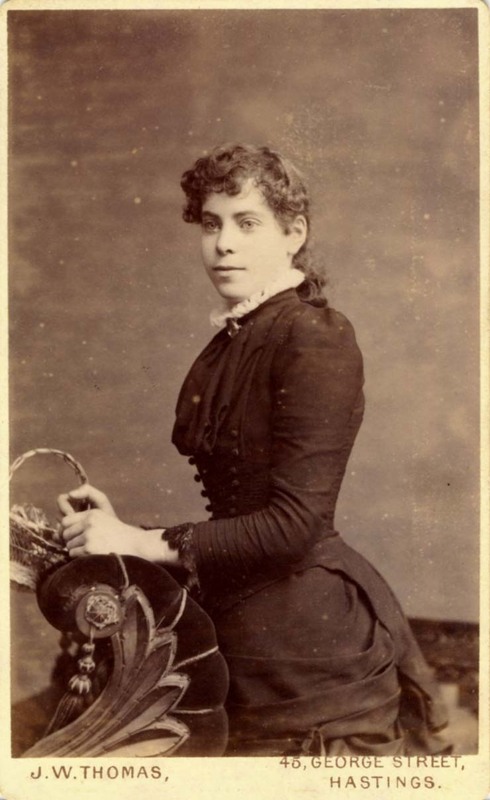 [ABOVE] A carte-de-visite portrait of a married woman, taken at J. W. Thomas's studio at his branch studio at 52 Robertson Street (c1878). On the reverse of this carte, inscribed in ink, is the negative number 60,403. [ABOVE] A carte-de-visite oval portrait of a young man, taken at John Wesley Thomas's studio at 45 George Street, Hastings (c1876). On the reverse of this carte, inscribed in ink, is the negative number 35,369. 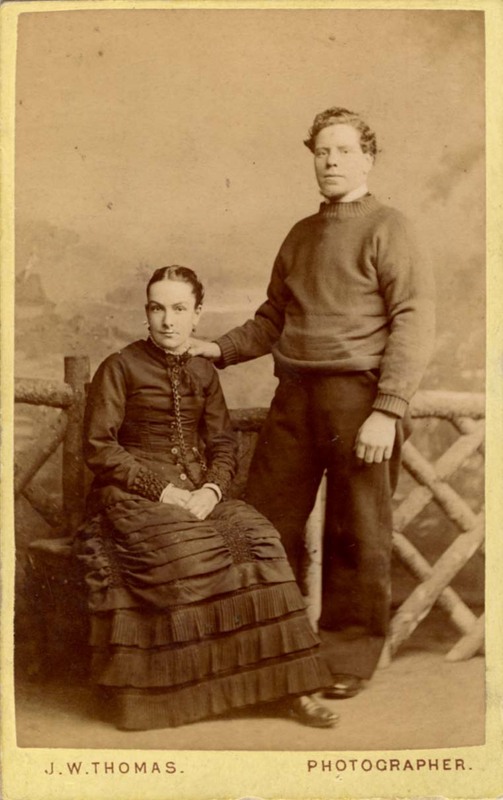 [ABOVE] A carte-de-visite portrait of a fisherman and his wife, taken at John Wesley Thomas's studio at 45 George Street, Hastings (c1880). Inscribed in pencil on the back of this carte are the words "The couple the family stayed with in Hastings". The negative number is given as 40,435. 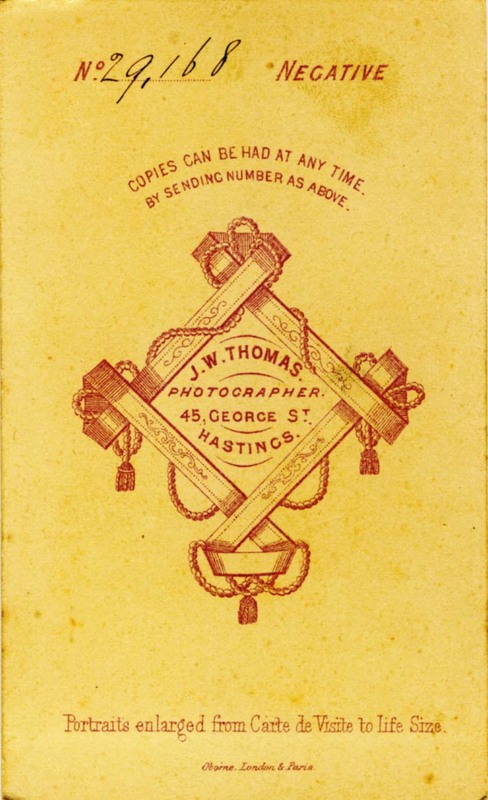 [ABOVE] The reverse of a carte-de-visite dating from the early 1880s showing J. W. Thomas's trade plate for 45 George Street, Hastings and the negative number of 45,862. This trade plate appears on the back of the portrait of the young woman with the flower basket on the right. 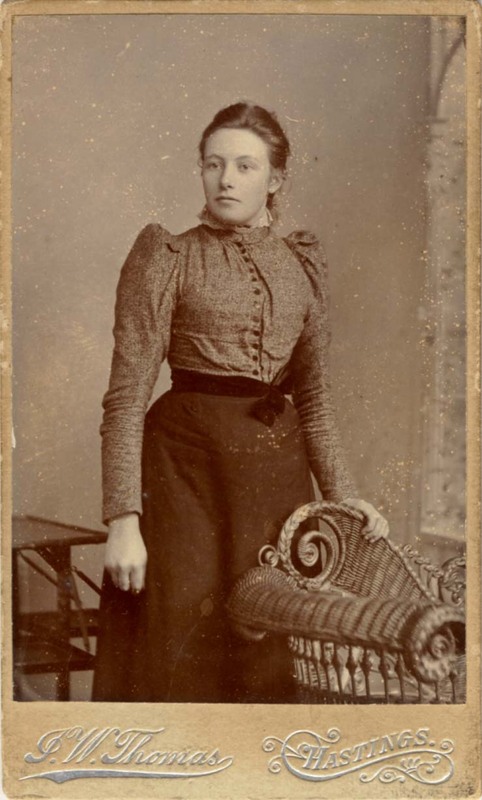 [ABOVE] A carte-de-visite portrait of a young woman holding a flower basket, taken at John Wesley Thomas's studio at 45 George Street, Hastings (c1883). On the reverse of this carte, inscribed in ink, is the negative number of 45,862. 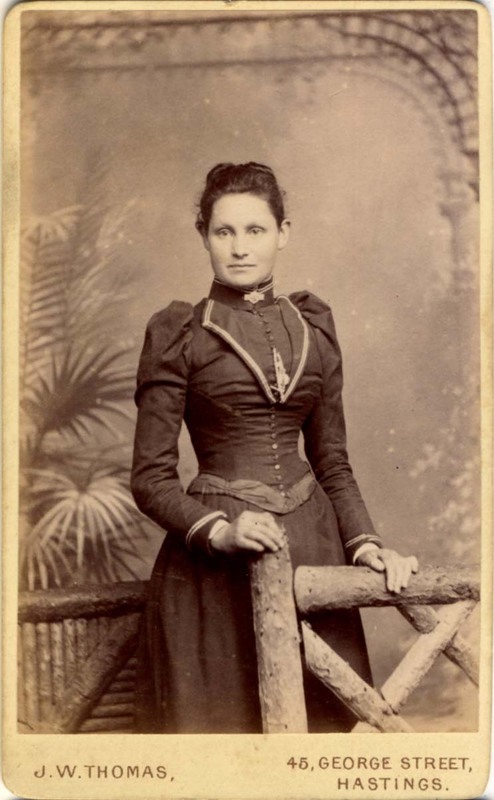 [ABOVE] A carte-de-visite portrait of a woman standing by a rustic fence in front of a painted studio backdrop. This photograph was taken at John Wesley Thomas's studio at 45 George Street, Hastings around 1892. On the reverse of this carte, inscribed in ink, is the negative number 58,384. 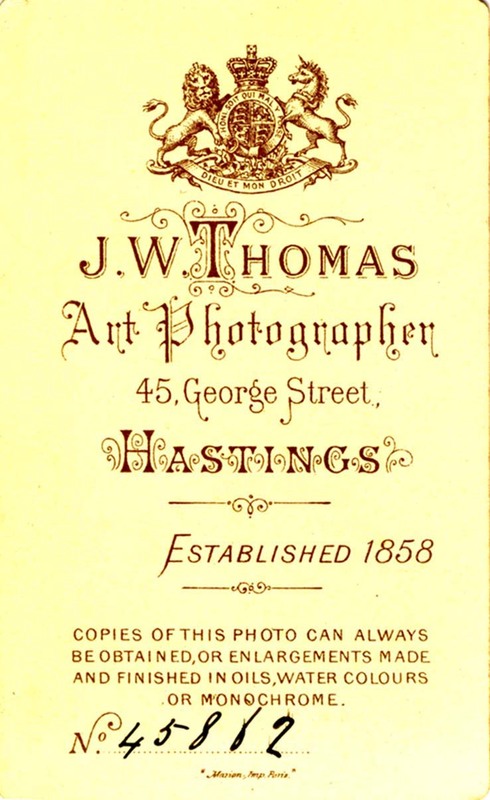 [ABOVE] The reverse of a carte-de-visite dating from the 1890s, showing J. W. Thomas's trade plate for 45 George Street, Hastings and the negative number of 61,145. This trade plate appears on the back of the portrait of the young woman on the right. 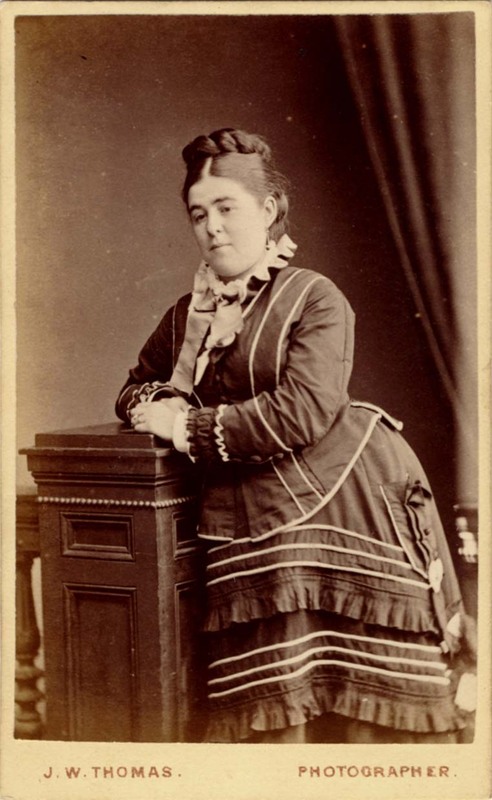 [ABOVE] A carte-de-visite portrait of a woman standing by a cane chair. This photograph was taken at John Wesley Thomas's studio at 45 George Street, Hastings around 1894. On the reverse of this carte, inscribed in ink, is the negative number 61,145. 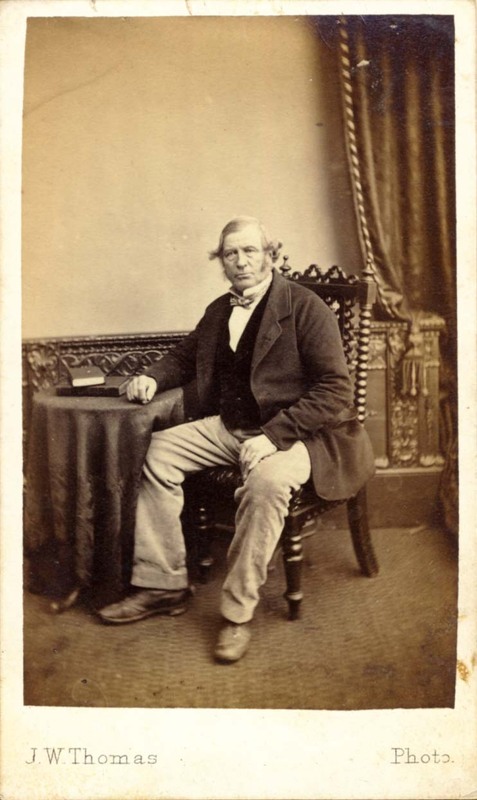 [ABOVE] A carte-de-visite vignette portrait of man, taken at John Wesley Thomas's studio at 52 High Street, Hastings (c1862). On the reverse of this carte, inscribed in pencil, is the negative number 638. These two carte-de-visite photographs could be from a series of "celebrity cartes" produced by John Wesley Thomas. The man in question has the appearance of a minister of religion. John Wesley Thomas was brought up in the Methodist religion and it is possible that the subject was a well known Methodist preacher. "Celebrity Cartes" of Ministers of Religion were not uncommon in the 1860s. In the early 1860s, studios in Brighton were advertising cartes-de-visite of local celebrities. 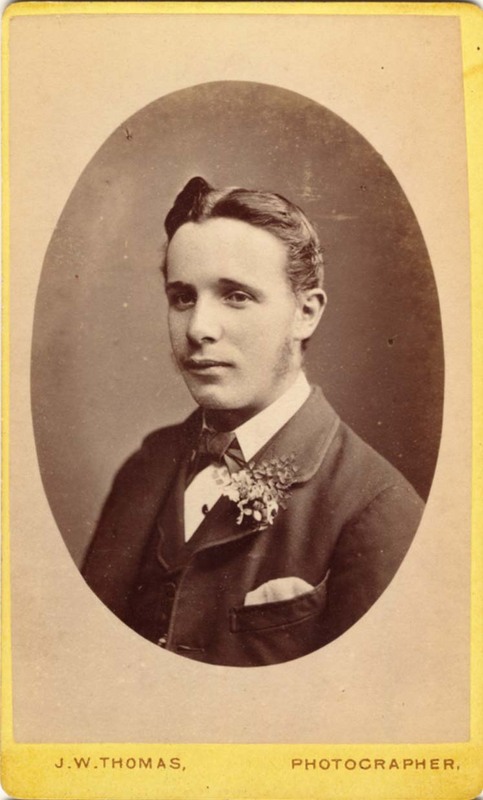 William Hall, proprietor of the studio at 13 St James Street, was one of the first photographers in Brighton to promote celebrity cartes. 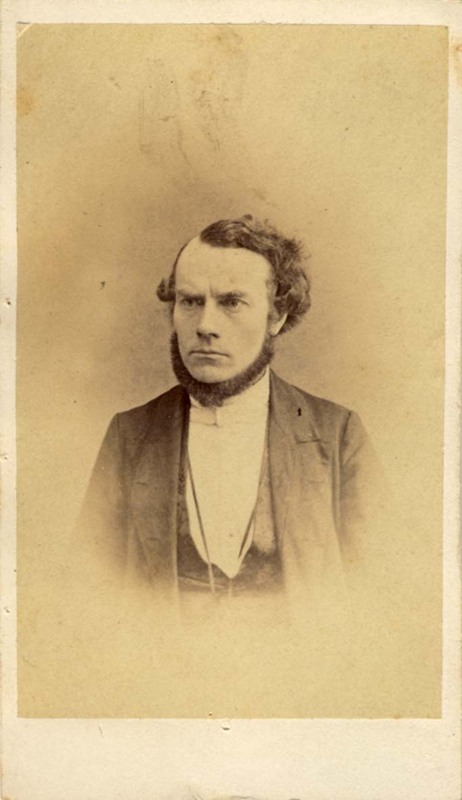 In a newspaper advertisement dated 27th February 1862, Hall offered to the public a set of carte-de-visite portraits of "Eminent Ministers - taken from life." 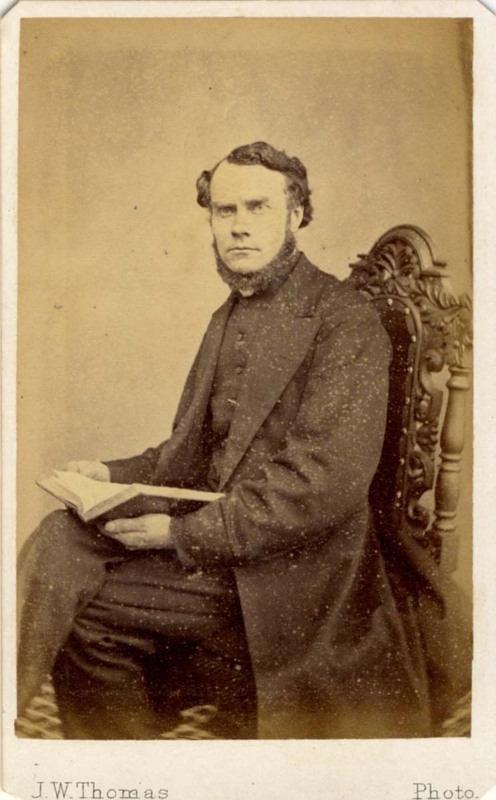 Hall listed 20 church ministers who were featured in his series of carte-de-visite portraits, including the Reverend T. Trocke of Chapel Royal and Reverend J. L. Knowles of St Peter's Church. If anyone can identify this "Mystery Minister", I would be pleased to hear from you. [ABOVE] Another carte-de-visite portrait of the man photographed in the picture opposite. This portrait was taken a few years later at John Wesley Thomas's High Street studio. On the reverse of this carte, inscribed in ink, is the negative number 4126, which suggests a date of about 1865.